Get your eyes peeled for the newest contest at Gino’s East! We have some cab toppers cruising around the streets of Chicago with our logos on them. Can you spot the topper in time to take a photo? If you can, you win! See a Gino’s East cab topper around town? Take a picture! Even better, take a selfie and share it with us. When you share your image, tag the appropriate tag on the topper for a chance to win a gift certificate to some of the Gino’s East locations! 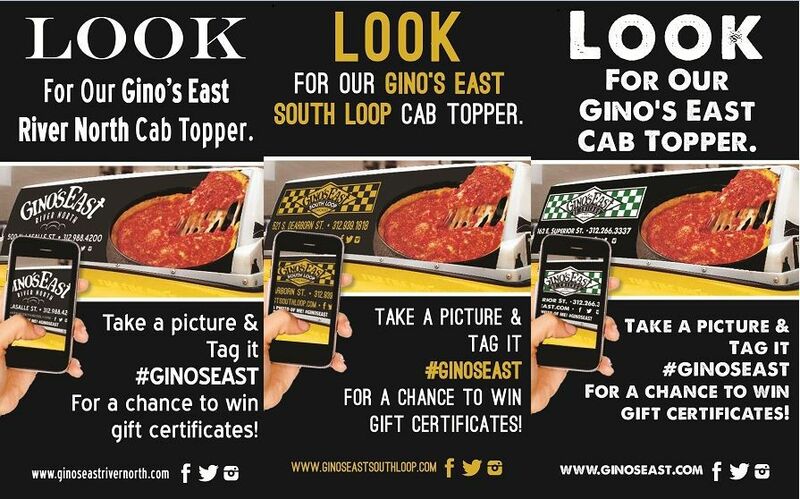 Cab toppers for Gino’s East River North, Gino’s East South Loop and Gino’s East Superior St. are all circling the city waiting for you to find them. Can you spot our toppers? Look for these specific banners when you’re out and about. It’s easy! Once you take a picture with our toppers, upload and post it to the specific location page. Did you find the Gino’s East River North Topper? Upload it to the Gino’s East River North Facebook page. Same for Superior and South Loop. Entries for Twitter and Instagram are also accepted. Use the hashtag #GINOSEAST on the topper when you upload your photo for a chance to win! The contest will run until December 31, 2014, so don’t wait to start hunting down these toppers. We aren’t saying how much you’ll win, but it will be worth it. Multiple entries are welcome, but participants can only win one gift certificate. Good luck!